In the battle of the cheap tablets, is anyone really a winner? Update: Aldi is completely out of stock of the £80 tablet in all stores. 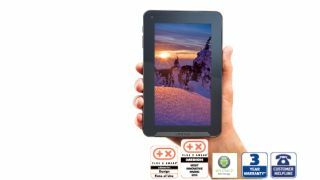 Because the Lifetab was a "specialbuy" promotion, the company is unlikely to stock more of the slates in the future. To Tesco! The quest to offer the cheapest tablet of all time stepped up a gear this weekend as Aldi started selling an £80 Android tablet, to the delight of bargain-hunters who happily queued up in the cold to get their mitts on the cut-price slate. The Lifetab is a 7-inch device which is actually made by Medion - its full name is the Medion Lifetab E7316 - and comes with 8GB of storage, 1.6GHz quad-core processor and runs Android 4.2.2 (Jelly Bean). It's also rocking 1GB of DDR3 RAM so it should run pretty smoothly, and the 7-inch screen comes in at a 1024 x 600 resolution. That's not going to have you crying tears at the beauty of the image reproduction, we're sorry to say. You may be crying tears of frustration at the 4 hour battery life, though. You may be out of luck if you're thinking of hopping down to your local Aldi as stock is super-limited and most stores are already out. The Aldi tablet comes not long after Tesco launched its Hudl tablet for £119 and Argos quickly followed suit with the Argos MyTablet for £100. We weren't in love with the MyTablet, which offered laggy performance, a low-res screen and frustratingly low battery life, while the Hudl fared a little better with the apps and the camera being our main bugbears.